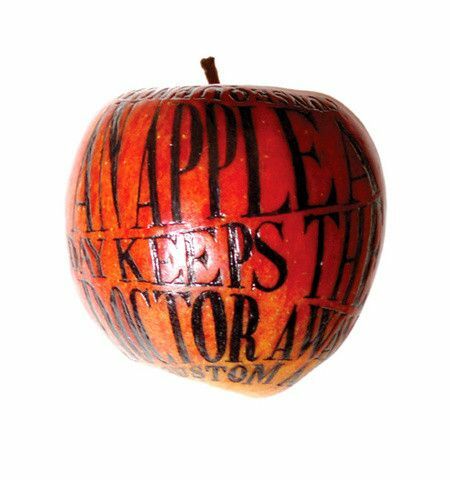 There has always been a lot of buzz about apples. And there’s that whole Garden of Eden thing…. How did apples get such a following? I guess because they are pretty to look at, are sweet, crisp and juicy, and are good for you, to boot. Since we are in that part of the year when kids start going back to school, I’ve been thinking more and more about easy things moms can make to send the kids off to school with a good breakfast in their tummies or something packed in for lunch that will satisfy them and remind them of home. 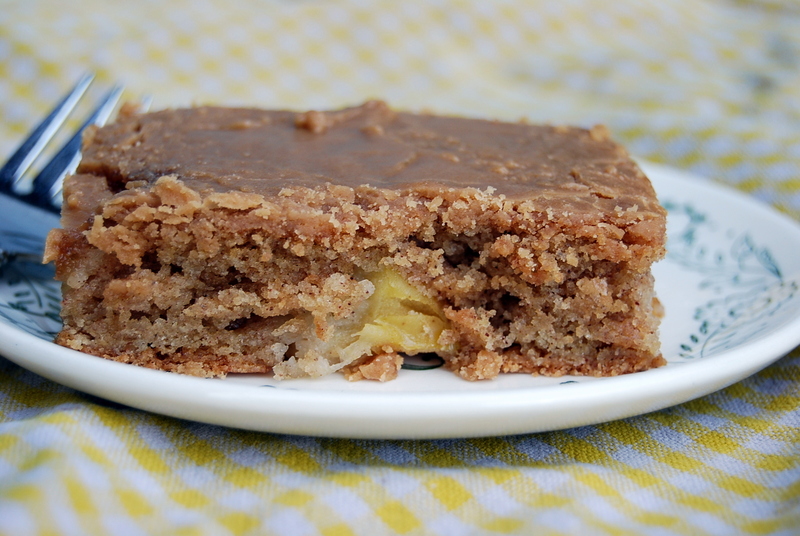 This is one way to do an apple today…caramel apple snack cake! A square of this cake and a cold glass of milk would be a nice “welcome home” after a long school day. Who wouldn’t love that? In a medium mixing bowl, combine flour, baking soda, salt, sugar, and spices. Set aside. In another mixing bowl (or bowl of a stand mixer), whip the two eggs until foamy and light. Add oil and vanilla extract. Mix for 1.5 to 2 minutes on medium-high speed. With mixer on low speed, add flour in two or three scoops at a time, mixing only until flour is no longer visible in the batter. 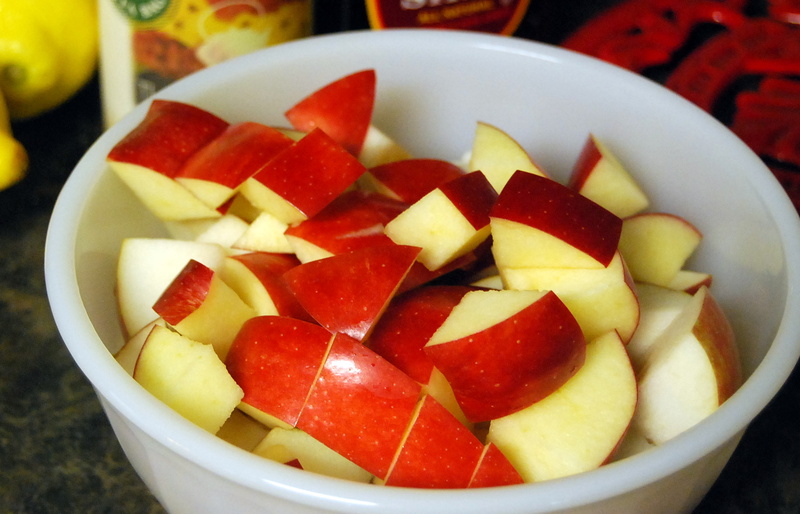 Use a spatula to fold in apples, nuts and/or cranberries. Remove from oven and place on cooling rack while making the glaze. Make the glaze: combine all glaze ingredients, listed above, in a medium saucepan. Place over medium heat, and continually stir while you allow the mixture to come to a gentle boil. Stir while gently boiling for 3 to 3 1/2 mintues, then remove from heat. Invert cake on plate, then quickly spread the glaze over warm cake. Glaze will set quickly, so you have to hurry. Serve warm (with vanilla ice cream? Yes, please!) or cool with a glass of cold milk…or a cup of hot coffee. The cranberries really wake this cake up! If your family doesn’t like them, they’ll still really enjoy the caramel-ly flavor with the sweet apple chunks. It’s a great combination! Look at the chunks of tart apple…so nice to bite into. Next Post Tortellini-vegetable soup – quick, comforting, good for you!